Awe yes, the beautiful Florida beaches. The white sands, the blue water, the rolling waves, the jelly fish. Oh, that last one is not on the brochure? Well, they should put jelly fish on their brochure for this time of year. They have been bad and my sister had told us that the jelly fish were bad at the ocean, but we wanted to play at the ocean. 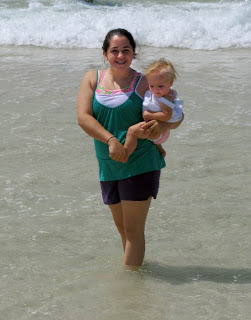 My dear sister humored us and we walked over to the ocean. It didn't seem too bad. 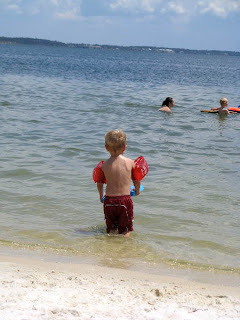 There was a purple flag up for a warning for the jelly fish, but we did not see any in the water. We started out just testing the water out slowly. Here Tori is wading in the water. The waves here are really mellow and gentle. Nothing like the large waves I am used to seeing in California (my family vacationed there every summer since I can remember). And to our surprise, there were no jelly fish to be found. So, we got a little bit farther into the water. Big Cowpoke even took his shirt off and jumped right in. He was all excited to be at the beach. That is all he has talked about this summer, going to the beach. The playing started and we decided that the ocean was save enough and jelly fish free enough for us to stay there an play. So, Uncle Anton and I ran back to the cars and loaded up our arms with all of our stuff. That included one cooler, an umbrella, lots of towels, beach toys, floaties, boogie boards, and more towels. 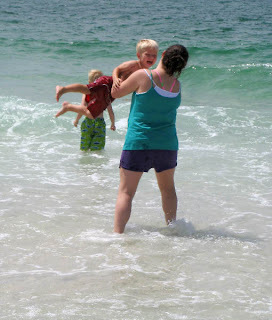 We had our arms full and started back to the beach. As Anton and I walked onto the beach, my sister yelled to us, "Don't come, Tori just got stung by a jelly fish! Let's go to the bay!" Poor Tori got stung. She was tough though and then we trucked it across the street to the bay. That is where the real fun began. Break out the arm floaties we are going to the bay!! And guess what else we did? Yep, we swam some more! 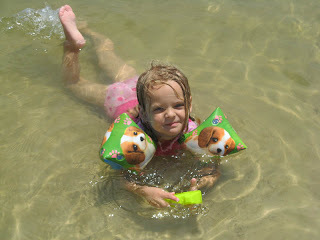 Even Cowpokette got in the water. 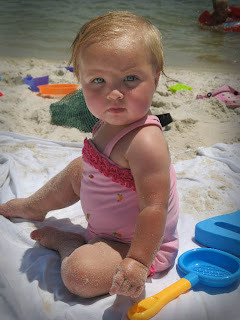 She really liked the beach. The kids were having fun. I on the other hand am not a beach person. 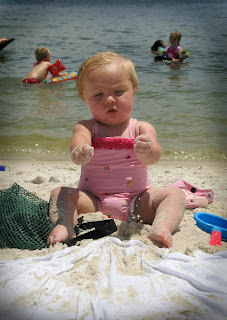 I do not know why, but there is just something about the beach that kinda freaks me out. I did get into the murky, slightly mysterious water. Then the fish started nibbling at my legs and that ended the whole water thing for me. I then decided to be a beached whale for the remainder of the day. It's okay because somebody had to stay ashore and keep an eye on the little ones swimming. I love the dry land. I think it's weird that I will get all sorts of dirty in the barn, but when it comes to the beach, yuck! Maybe it's the live fish swimming in the water thing? I am not too sure, but I do know my water troughs are cleaner than the beach and I don't go swimming in those. I know I am weird. I was joined ashore by my sister and some of the kids for lunch. 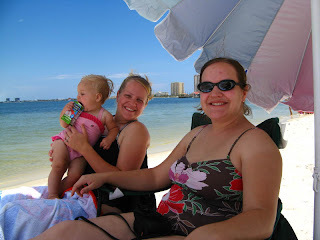 We are some serious hot beach babes! While we sat there eating we got to watch a fantastic storm roll in. There was thunder and lightning. It was far away and seemed to blow right over us. Nothing will stop us from enjoying the beach, not even a little thunderstorm. It did scare some folks away. They went packing fast. 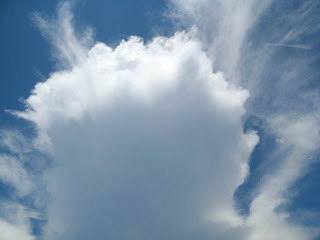 Here is the big cumulus nimbus cloud that was the front runner of the storm. It was really neat! Here you can see how the storm blew over us. You can even see it raining in the back ground. Pretty neat huh? You have got to love southern rain storms. It is really amazes me how you can see the fronts coming here. 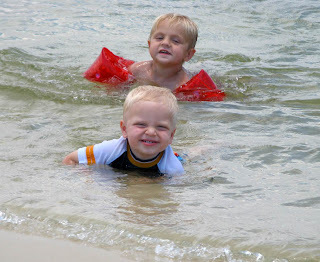 But after a short break the crazy beach lovers got back in the water! Weeeee!! Fun water games!! 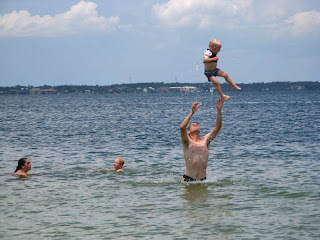 Toss the Toddler!! Big Cowpoke got a boogie board. He was so cute! We saw it at the store and he was begging for the "surf" board. I told him it was a boogie board. He then said, "What is a boogie board?" Poor sheltered child. 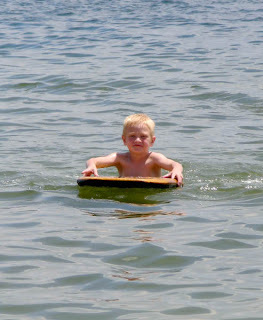 Despite him not knowing what a boogie board was it sure didn't take him long to learn how to use it. He was a pro. Then I tried to dig a big hole for Cowpokette to play in. The hole did not get very large before it was taken over by little kids. But they had fun playing in it. 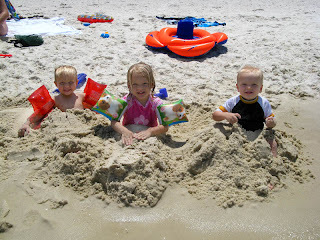 And what would a beach trip be with out burying yourself in the sand? It's so much fun to be a kid! 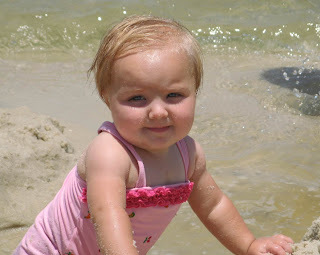 To get all dirty and not worry about all the bugs that are in the sand and then all the fish that are in the water that you have to wash off in before you can even think about drying off! Awe yes, the care free life of kids! 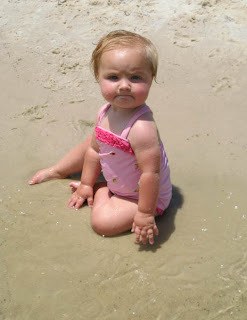 But last but not least, I will share with you the pictures of the real Beach Babe. Cowpokette really loved the sand. Okay I will stop obsessing over my little girl. 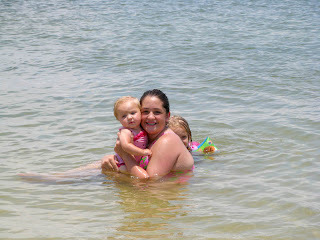 We all had a great day at the beach. My sister and I were trying to dry off and we were discussing how we were going to drag the kids out of the water and into the cars. While we were talking she got hot and wanted to cool off, so, she walked out into the water, just about mid thigh, and not 5 minutes later she was attacked by a jelly fish. It wrapped it's tentacles around her leg and then it stung her daughter. So, we all went running out of the water and the kids then called it quits. Is that a way to end the day at the beach or what? At least we didn't have to drag the kids to the car kicking and screaming. We all had a good time! Tomorrow I am going to post about the guys trip off shore fishing! So, until next time, y'all come back now ya hear! LOVED your little beach babe. So cute! The picture of you and Cowpokette is fabulous - and the clouds are just beautiful. Looks like you had a wonderful day. Love the pics! Looks like you all had a fablous time, besides the jellyfish incident! I know we went to Galvestion (a long time ago) and I will never go back there were jellyfish everywhere. The dead ones can even sting! The cloud and storm pics, just awesome! 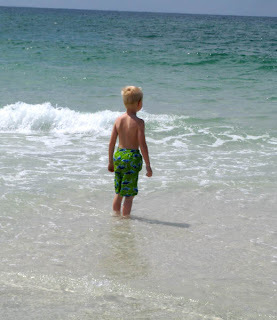 Thanks for sharing your beach time with us! Great pics! Hooray for the beach!! Boo for the jelly fish. I'm going to be scarred for life. Looks like lots of fun!! Your daughter is just darling, so sweet!! So sorry your sister got stung! Oh, yes, those kitties are mine and you are welcome to take home a couple in about 8 weeks!!! Wow! What beautiful photos of your children and the sky. I love sky. Jellies I do not love. I was stung by some one time and I was way out in the ocean and I cried and swam fast to shore. I hope it didn't hurt the kids too much. Oh, the jellyfish would scare me, too! What kind were they? We had them in our bay growing up, but they don't have tentacles and are harmless. Those clouds were amazing. I am just jealous you got to relax and play on the beach. Now that school is out,I could use a couple of days to do that! Jellyfish -yuck! Other then that though it looks like you had fun, the pictures were great. Last time I was at the beach was nov 04 in mexico and who knows how many years it will be before I ever see a beach again! 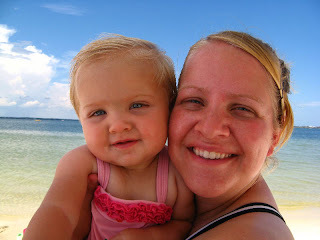 GREAT picture of you and your daughter. All in all, a very quality post! :) You had tons of really good pictures on here. 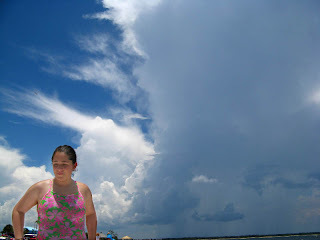 I just stumbled on to your blog and love your beach post. 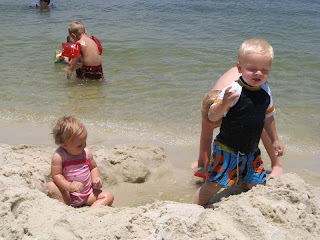 My family just took a beach vacation too and loved, loved, loved it! We didn't have any jellyfish encounters, sorry you had to run into those nasty things! Great blog! Come visit me sometime!